What intelligent, reasonable politician could possibly think it’s a good idea to make newspapers pay the costs of litigation against them even if they win? 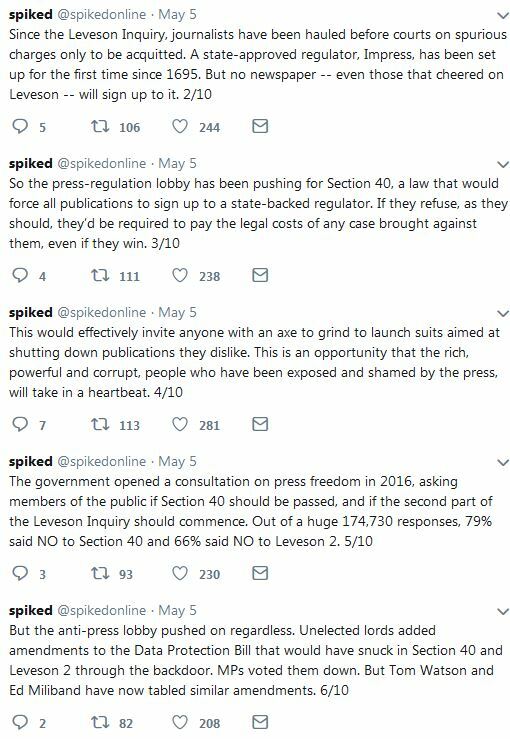 So if (say) The Spectator refuses to sign up to this state regulator, it would only take a series of vexatious cases brought by the Welsh against Rod Liddle to bankrupt the magazine and have it shut it down. Quite how impoverished local newspapers could survive is unknown. Actually, it isn’t unknown: they couldn’t possibly survive. Nor would they survive the potential fines which could be imposed as a result of the misuse of data. 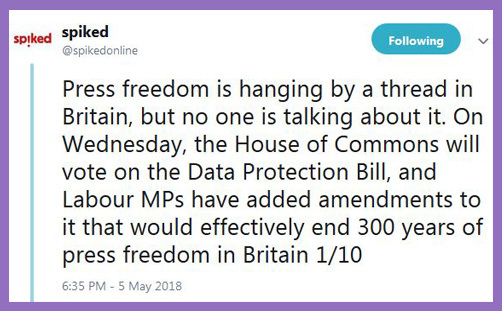 Clause 164 of the Data Protection Bill gives the Information Commissioner power to determine whether a journalist’s handling of personal data is relevant and legal. And this determination would need to be made prior to publication. The task of the investigative journalist would be massively impeded by this proposal: indeed, it would give the Information Commissioner an effective veto over publication, making her the arbiter of what is or is not in the public interest. The secret filming of what goes on in abortion clinics; the secret recording of corrupt politicians; the secret arrangements by which sin, vice and crime are discovered and exposed would all have to pre-approved by the Information Commissioner. What does she know about liberty? What does she know about the imperative of maintaining a critical, original, imaginative, independent and non-conforming press? How can the truth be found without the necessary conditions of freedom, of which press freedom has been foundational since state-licensing was abolished in 1695? Truth cannot be uncovered without freedom of self-expression: press freedom hangs with freedom of speech and freedom of religion, and they are all being trampled on and incrementally eroded. 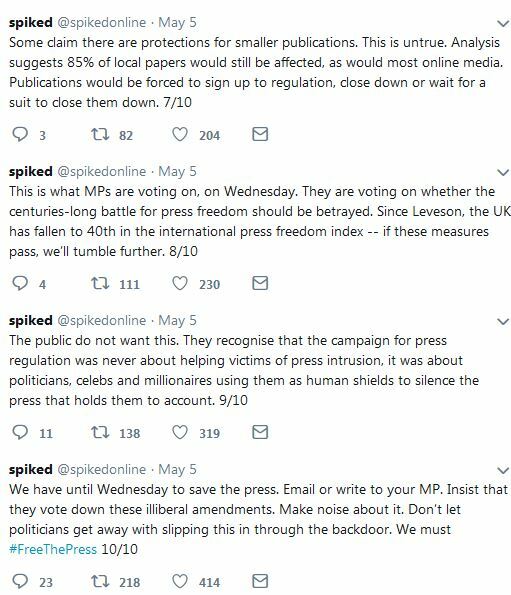 When the state seeks to control the press with mechanisms of prior-approval and editorial intrusion, there is little space for the belligerent non-conformist or the eccentric controversialist. All indispensable scrutiny is imperilled by bureaucratic process and statist dogma. If everything that’s written must henceforth conform to the Information Commissioner’s notion of journalistic morality, and if Parliament has gifted her this power to mitigate the effects of a bad society, to whom may one appeal for a more justly organised apprehension of freedom?